...für "A Spoon Full of Sugar". Ist doch mal was ganz anderes, nicht wahr! A "Happy New Year"-Card for "A Spoon Full of Sugar". Something different, isn't it. Love this challenge! deine Neujahrskarte sieht richtig Klasse aus!!! Mir gefällt deine coloration. Oh this is adorable! I absolutely LOVE the colors that you have chosen! Fantastic! Die Karte ist echt süß.Das Szenestempeln hast du gut hinbekommen! Awesome card! 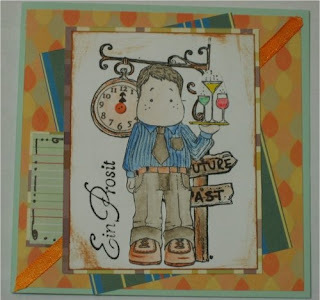 I love the image, and especially love how you did the signpost behind Edwin!! It looks great!